The Ward 14 by-election happens on Monday June 20. The vote is taking place to replace our Trustee, Sheila Ward, who died in the winter. The winner will serve on the school board for the remaining three years of its current term. Nominations have now closed and we have 12 candidates in the race. Official contact information for each of them is listed at the City of Toronto’s website. The candidates will be at a special Meet & Greet on Tuesday May 24 from 6 pm at Jarvis Collegiate (459 Jarvis). 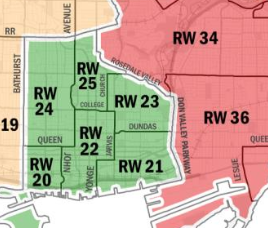 The City of Toronto has released its review of the sizes and boundaries of the Wards that make up City Council. Our area currently is Ward 28 represented by Councillor Pam McConnell. It’s experiencing the massive growth that encompasses all of the downtown Wards. The recommendation for our future boundaries splits Ward 28 into two Wards. The northern one (Recommended Ward 23) includes Cabbagetown, Regent Park, St James Town and the eastern part of the Church Street Village. 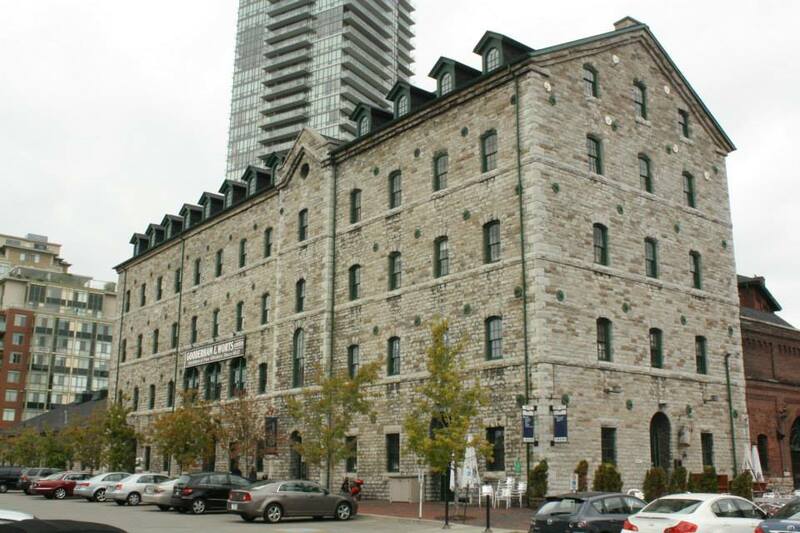 The southern Ward (Recommended Ward 21) covers Corktown, the Distillery and the new developments in the Canary District and along the waterfront east to Yonge. To implement this change in time for the 2018 civic election, the report needs to be discussed and passed by City Council by December 2016. This allows time in 2017 for an OMB review and final decision in 2017. Following an OMB decision, implementation can be ready in late 2017 and used in the 2018 election. The study uses lots of facts, maps and illustrative materials. You can find it online here. 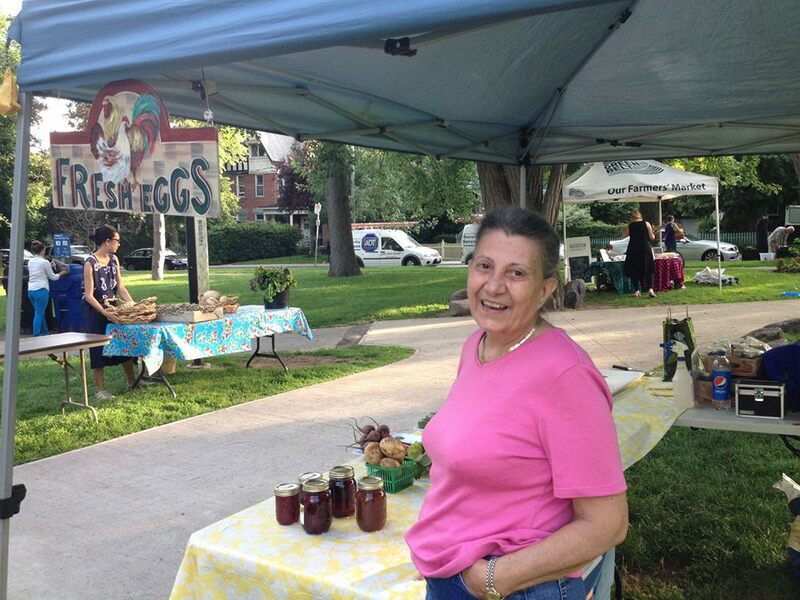 For 16 years, Tina Ruggerio has been an integral part of the Cabbagetown Co-op Nursery School. The school will close its doors in June. Many parents want to give her a memento for her years of outstanding service. 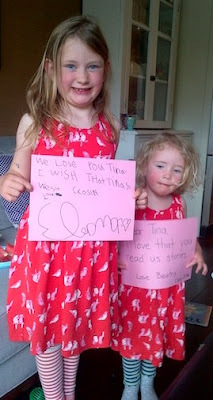 They’re assembling a book of “Tina’s kids”. If your child has ever been in one of her classes, please put together a small sign with a message and take a picture of your child holding your sign. Send it to ccnspresent@gmail.com before June 13. Notices posted at Riverdale Farm (Winchester east of Sumach) are asking for volunteers to help with various gardening chores like weeding, preparing beds, planting annuals, deadheading, watering and edging. Two hours each - on every Wednesday afternoon from 4 to 6 pm to October 26 and on five Sundays from 9:30 to 11:30 am (June 10, July 12, August 7, September 18 and October 2.) If interested, come to the Drive Shed just inside the Winchester entrance on the date when you can work. Tools are provided. Everyone 14+ is welcome. The Cabbagetown Residents Association is seeking volunteers for its Board of Directors. Nominees will be elected at the CRA Annual Meeting on Wednesday June 8, 7 to 9 pm, Stout Irish Pub (221 Carlton). The Board meets monthly (except in the summer) and plans the CRA’s activities and its responses to community issues. Projects include the annual Forsythia Festival, the Hallowe’en Pumpkin Walk and the Spring community cleanups. For more information, check the Association’s website or email Kelley Teahen at kellyteahen@gmail.com. The Riverdale Farm Stewardship Group invites you to visit the Farm (Winchester east of Sumach) and snap a photo. Contest runs from now until Saturday June 4. Use your photo to show what the Farm means to you. Winners will enjoy terrific prizes. There’s a Facebook page that tells you how to submit your pictures. 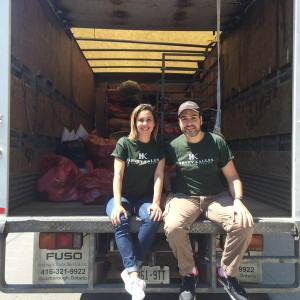 Liora Tal-Bloch and Daniel Bloch organized their successful annual Cabbagetown clothing drive in early May. They contributed the donations to the Oasis Addiction Recovering Society. The Society has posted an interview with Liora on its website - click here to read the story. 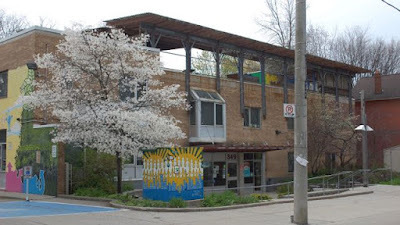 Central Neighbourhood House (349 Ontario) has raised $150,000 in its campaign to help Syrian refugee families. These funds will sponsor three families - 21 people altogether. Just as many other private sponsors are experiencing, CNH has found that their beneficiary families are now being processed but the system is moving slowly. In the meantime, CNH is working through Lifeline Syria to help where possible with people already here. CNH has also just been funded by United Way to hire a settlement worker who will assist with these refugee families as they arrive. The new YMCA in the Canary District is now in the middle of its opening events. There are tours, free fitness classes and a chance to join at a reduced rate. Events include a bootcamp, soccer, family play, hatha yoga, badminton and table tennis, restorative yoga and barre. 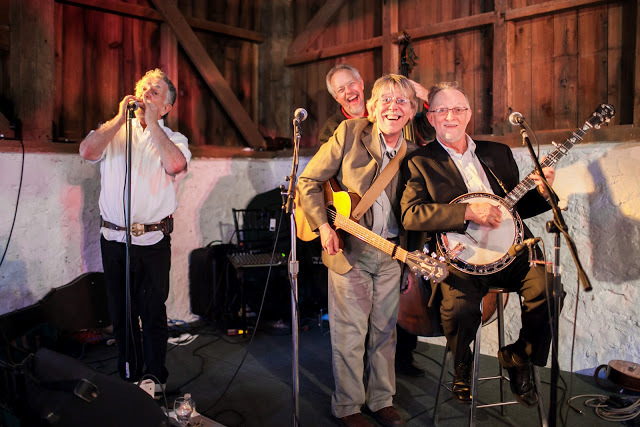 Check out the Y’s website for a full list and for dates and times. It starts on Tuesday May 24 from 3 to 7 pm in Riverdale Park (Winchester at Sumach). It’s a little early in the season to get your favourite rutabagas but other seasonal goodies are here. Come and support your local farmers, enjoy fresh seasonal food and mingle with friends from the neighbourhood. Many of last year’s favourite vendors are returning along with several new ones. There’s also a really good Facebook page that will tell you each week about the Market’s specials and events. 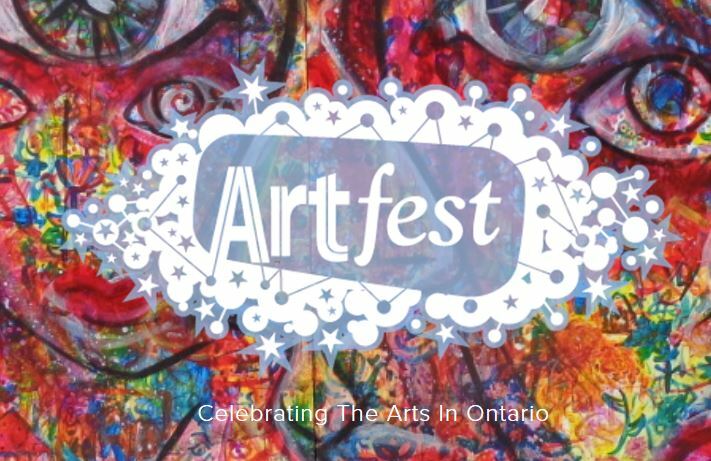 75 artists and artisans will exhibit their works in this juried art show. 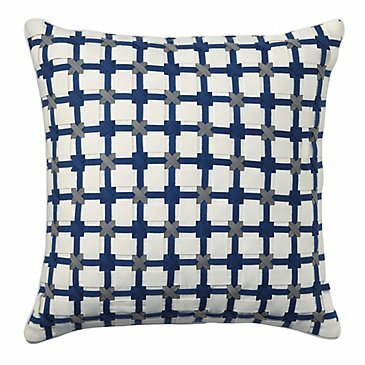 Pottery, jewellery, textiles, paintings, glass, leather and more. There’ll be gourmet food and live music along with the show. Distillery, Saturday May 21 to Monday May 23, 11 am to 6 pm. 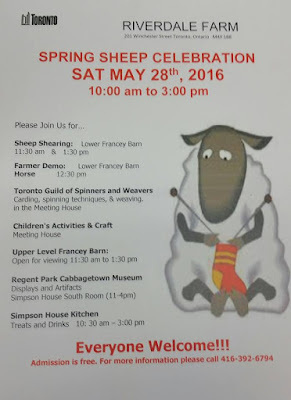 Visit Riverdale Farm (Winchester east of Sumach)) to watch a sheep shearing in the Lower Francey Barn on Saturday May 28 at 11:30 am and 1:30 pm. 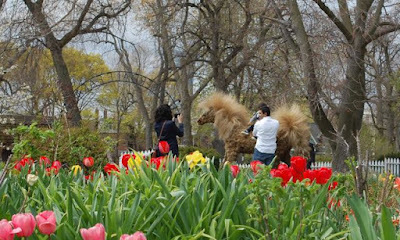 It’s part of a busy day’s schedule that runs from 10 am to 3 pm - farmer demos, a demonstration of carding, spinning and weaving by the Toronto Guild of Spinners and Weavers, kids activities, exhibits at the Cabbagetown Regent Park Museum and treats and drinks in the Simpson House Kitchen. The Deaf Culture Centre (15 Mill St, Distillery) is open on Saturday May 28 and Sunday May 29 from 10 am to 5 pm daily. The Daniels Spectrum (585 Dundas East), open on Saturday May 28 from 10 am to 5 pm. The website for the full Toronto event lists all the venues that are open to the public for tours during this weekend. 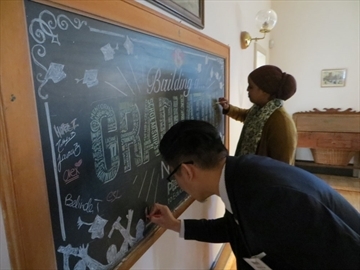 The CPA’s annual meeting is scheduled for Tuesday May 31 at 7 pm in the Meeting House in Riverdale Farm (Winchester east of Sumach). Awards will be presented for the Peggy Kurtin Award (for a successful facade renovation) and Volunteer of the Year Award. The guest speaker will be Heela Omarkhail, the Manager of Community Partnerships in the Daniels Corporation. 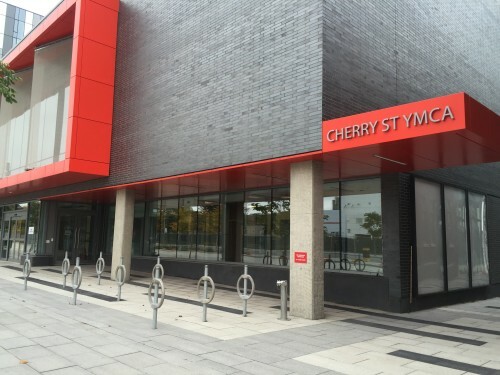 She’ll talk about the progress being made in the Regent Park revitalization and about the new ties growing up between Regent Park and Cabbagetown residents. Lori Oschefski is the CEO of the British Home Children Advocacy & Research Association. 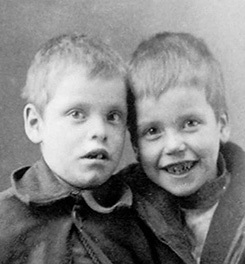 Her talk will highlight the contributions made by the 100,000 children who came to Canada from Britain between 1863 and 1949 and their 4 million descendants. Wednesday June 1, 6:30 pm, Enoch Turner Schoolhouse (106 Trinity St). Tickets are $10/members and $12/public, available at the door and online . The tenth annual garden tour happens on Sunday June 5 from 10 am to 3 pm. You’ll get a peek into spectacular gardens, quiet back laneways and interesting Victorian architecture. 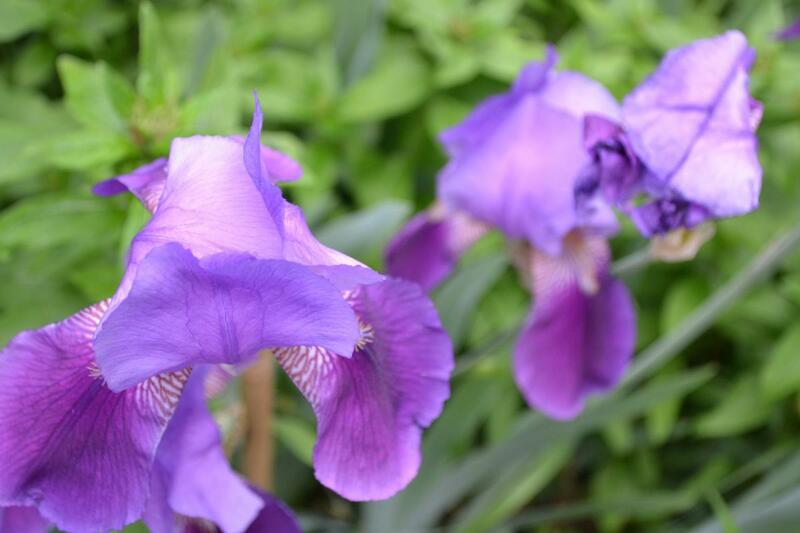 Marjorie Harris is the tour’s gardening expert this year and she’ll be joined by six Master gardeners. $15. Buy your ticket at several local outlets: Epicure (473 Parliament), Fairway Garden Centre (520 Parliament), Jay’s Garden Centre (360 Gerrard E), Kendall & Co (514 Parliament), Labour of Love (223 Carlton), Mi Casa (238 Carlton) and Spruce on Parliament (455 Parliament). You can also get your tickets online. For fifteen years, Pathways to Education has worked with high school students to help them with their studies and to encourage them to stay in school. The project has been a huge success. It started in 2001 with kids living in Regent Park and today, it also works in Lawrence Heights, Rexdale and Scarborough Village. 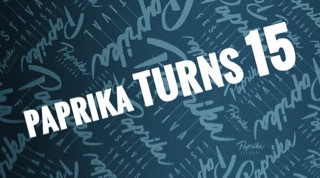 On Wednesday May 11, it celebrated its fifteenth anniversary. Justin Skinner has written about its successes in Inside Toronto. The Cabarets are intimate evenings with outstanding musicians, organized as part of the Soulpepper music program. 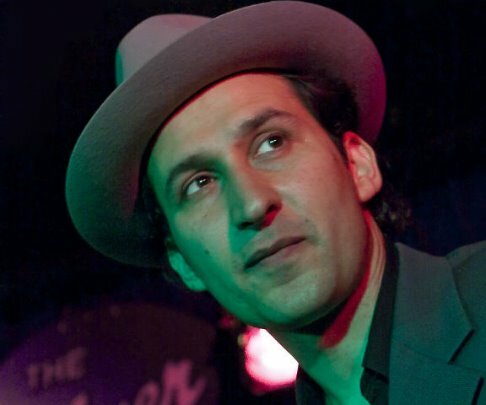 This week’s Cabaret features Raoul Bhaneja with Ken Whiteley and Terry Wilkins in “Raoul’s Blues Interviews II”. For details and tickets, click here. 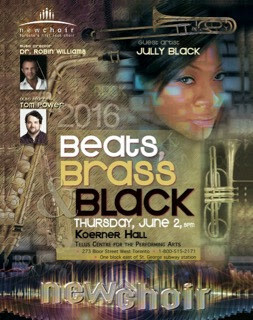 newchoir presents its next concert at 8 pm on Thursday June 2 at Koerner Hall (273 Bloor W) with guest artist Jully Black. newchoir creates rock concerts using unexpected arrangements of rock and pop songs from every decade since the 1960s. Its shows are regular successes - thanks no doubt to the Cabbagetown singers in its ranks. Click here to get your tickets. Duncan Fremlin and his friends will appear for the third time at the Stratford Summer Music Festival on Saturday July 30. This year’s show will highlight memories and music from the CBC’s long-running Don Messer days. It’s been a sell-out performance each year so get your tickets now! Click here. Toronto Dance Theatre’s season finale is a new duet created and performed by Christopher House and Jordan Tannahill. Thursday May 26 to Saturday May 28, 8 pm, Sunday May 29 at 2 pm and Wednesday June 1 to Sunday June 4 at 8 pm. Winchester Theatre (80 Winchester). Tickets available at the Box Office, at (416) 967-1365 and online. The company from Canadian Contemporary Dance Theatre (509 Parliament) returns to the Fleck Dance Theatre in Harbourfront (207 Queens Quay W) on Friday May 27 and Saturday May 28 at 8 pm. The program includes the Canadian premiere of Jose Limon’s The Winged and the world premieres of works by Deborah Lundmark and Hanna Kiel. Tickets are $15 to $38, available at (416) 973-4000 and online here. Paprika Festival is a youth-led performing arts festival that celebrates the talents of young artists and operates as a training ground for future professionals. This year’s program runs from Monday May 23 to Sunday May 29 in the Aki Studio at the Daniels Spectrum (585 Dundas E). Ten different performances plus a Director’s Lab (ticketed events - $10/each) and three play readings (free events). The Festival gala ($30) will happen on Thursday May 26 at 6:30 pm. Click here to see what’s on and when. Kendall & Co (514 Parliament) has new accent pillows that will freshen up your home and cottage with a dash of colour. Shop now for the best selection. Store hours - weekdays 10 am to 6 pm and Saturdays 11 am to 5 pm. The Running Room is opening officially at 465 Front and it’s organizing a 5k and 2.5k walk/run. The proceeds will support the new YMCA. Wednesday May 25, 6 pm, $10. To join the event, click here to register. 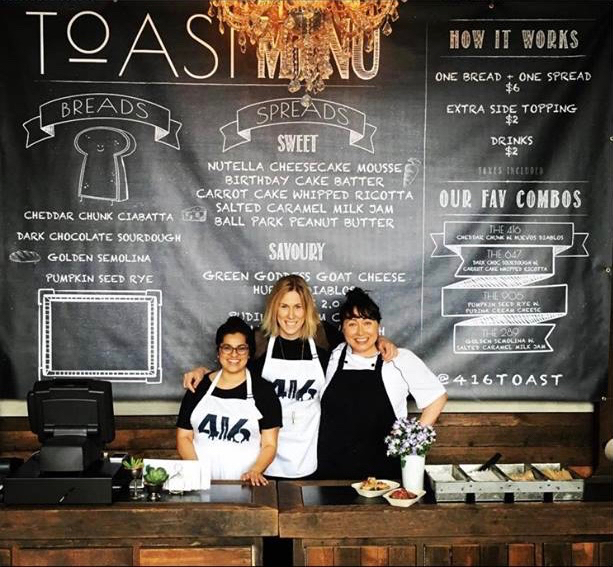 Avantderm (45 Mill St, Distillery) is hosting TOAST, a pop-up shop offering tasty artisan breads and mouthwatering spreads. Saturday, Sunday and Monday May 21, 22 and 23 and Saturday and Sunday May 28, 9 am to 3 pm. Your ticket for the Hidden Gardens tour is also a passport to great offers from local businesses. Over 20 restaurants and stores will give you specials like free desserts as well as attractive discounts on your same-day purchases. For a full list, check out your ticket or read the list online. Celebrate the first patio party of the season at Mill Street Beer Hall (21 Tank House Ln, Distillery). 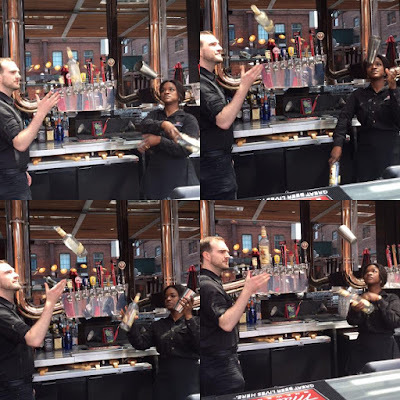 The bartenders will hold a flare competition. Live music with The Picture Frames. Thursday May 19, 6 to 10 pm. Steve Grant’s 60th birthday party is coming up and he’s celebrating. His fans will recognize him from his regular appearances in the Cabbagetown Festival where he belts out the best rock ’n roll at the corner of Spruce and Parliament. Since he’s having a big birthday, he wants to hold a big party - true Cabbagetown music fans are welcome, Saturday May 21, 9 pm to closing, Local GEST (424 Parliament). 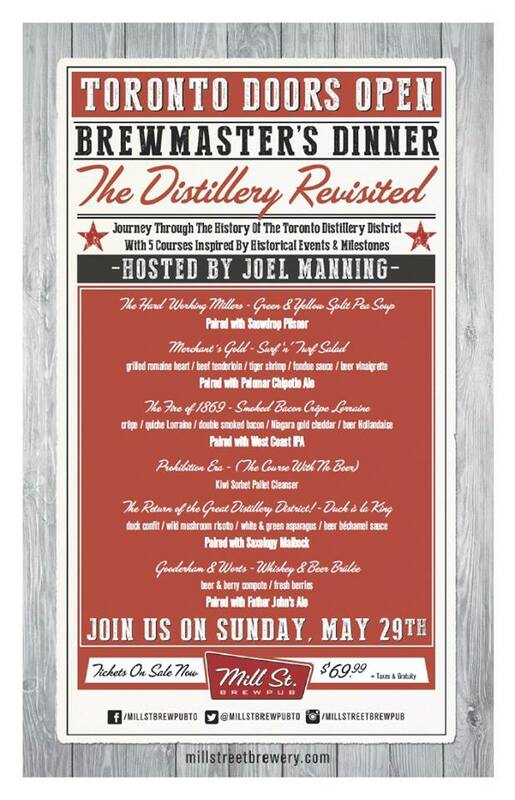 The Mill Street Brew Pub (21 Tank House Ln, Distillery) is having a special dinner to celebrate the history of The Distillery. Five courses, each inspired by an historic event in The Distillery’s past. Accompanied by matching beer. There’ll be a private tour and tastings through the brewery plus a live cooking demo with Chef Jeremy Eidt. Sunday May 29, 5 pm. $69.99. 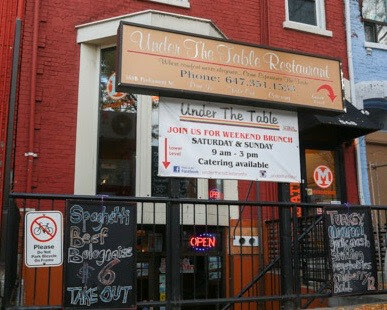 Under The Table (568 Parliament) will be closed for a week between Monday May 23 to Tuesday May 31. 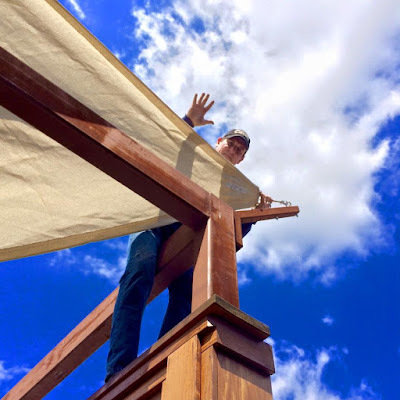 Duncan is making sure that the rooftop patio at the House on Parliament (454 Parliament) is ready to open. 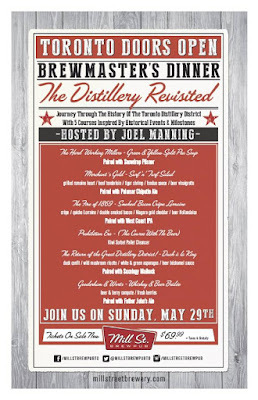 Brewmaster Dinner - The Distillery Revisited, dinner, matching beers, brewery tour and live cooking demo, $69.99.